There’s a subcategory of players in the league that appeal to the obsessive fan – the type that watches Gold Coast games in early May. 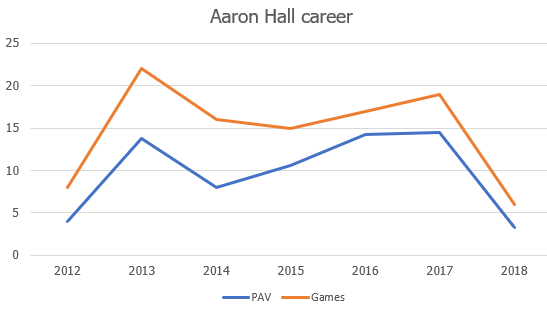 Amongst those types, Aaron Hall’s name has been long floated as underrated, and due for a breakout year (without ever actually delivering). Now Hall gets his chance in new surrounds. One of the last of the genuine pre-season draftees, Aaron Hall made his debut at age 21 for the Suns in 2012. He probably put together his best seasons in 2016 and 2017, when he rated as one of the Suns’ best five players and caught the voting attention of umpires with 11 and 10 Brownlow votes. A very poor 2018 has hurt his projected output, and at 28 he’s now at the age where players with such a poor season behind them are historically quite likely to have very limited careers from here. Half of the 20 players closest to him in age and PAV didn’t play again – with another five producing less than 5 future PAV. Just a quarter went on to have productive future seasons, and most of those players were great players coming back from an injury hit year. Hall doesn’t neatly fit that category. Despite those flashes of past quality, the trade between North and the Suns seems to reflect both Hall’s age and his questionable prospects from here. Pick 68’s expected career output is pretty close to our projection for the remainder of Hall’s career, and seems to reflect the low value both sides are placing on him. If North can get more than a season or two of useful football here, they’ve done well.